"Monkey Sea, Monkey Doom!" 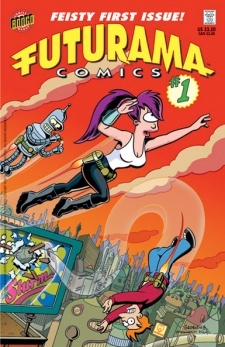 is the first comic issue, which was released on 22 November, 2000 in the US. 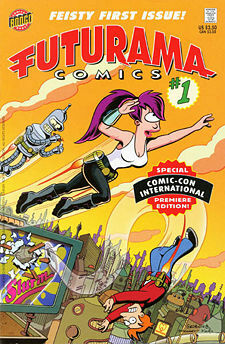 The comic was also available in a special edition during 2000's San Diego Comic-Con. After being asked to bury a dangerous device by the professor, the crew discovers a time capsule from the 1970s in the form of a lunchbox. Due to an ad in an old comic in the lunchbox, Fry decides to order some Sea Monkeys, but eventually dumps them in toxic waste, which turns out to be a mistake. When the Professor has Fry, Leela and Bender dig a hole in the floor of the basement of the Planet Express building to bury the Galactic Terminatrix 3000, a device that he used to accidentally blow up one of Saturn's moons, the crew discover a time capsule, in the form of a Partridge Family Lunchbox, from the late 1970s. Fry takes the contents for his own use, while the rest of the crew dismiss it as junk and think the 20th century was boring. Fry finds an ad for Sea Monkeys in the back of an old comic and buys some from Shifty's True Wonders of the 20th Century Emporium to prove the 20th century was cool. However the Sea Monkeys are dead and they fail to impress the rest of the Planet Express crew so he disposes of them in toxic waste. Dr. Zoidberg recovers the Sea Monkeys from the waste showing that they're alive and they've grown. By the next morning, they grow larger than the building and wreak havoc on New New York. The crew set out to destroy them in the Planet Express ship but fail. They eject out of the ship but one catches Fry. As it is about to eat him, the others call Sal saying they're not satisfied and he quickly solves the problem by killing the Sea Monkeys and Fry is saved. Planet Express is charged with the clean up of the Sea Monkey corpses, so instead they have Elzar cook the bodies and Dr. Zoidberg receives a feast. The title is a play on the phrase "Monkey See, Monkey Do". A special edition of this comic was made available prior to its release at Comic Con. The only difference was the colors and logos of the cover. According to the UK edition of Bart Simpson Comics #3, this issue was originally scheduled to be released in the United Kingdom on 23 May, 2002. Fry: Woo! Who needs ethics? Not us! Bender: Never had 'em, never will! Fry: Does anybody have an eight-track cassette player and Beta VCR I can borrow? Zoidberg: Ho, ho, ho... I'm laughing with friends! Leela: Well, I'll keep an eye on you just in case! Remember when you tried to sell your kidneys for salsa last week? Bender: He shoulda done it! I was offering below market value! Bender: I don't know anything about guns! Who do I look like, Charlton Heston's head? Fry: You don't want me! I'm turf, not surf! The letter enclosed with the time capsule ends with "P.S., LaRouche for President in '80", a reference to perennial third-party presidential candidate Lyndon LaRouche. Lum and Ten (from the anime series Urusei Yatsura) appear as pedestrians in one panel. In the splash page of giant Sea Monkeys rampaging through New New York, human-sized versions of Godzilla and King Kong can be seen fleeing from the destruction. One of the Sea Monkeys climbs an Empire State Building-like skyscraper and is shot at by the Planet Express ship, parodying "King Kong". In the first frame you see Homer Simpson's head made out of "Fun-Doh", Homer Simpson's head is covering the "Fun" of "Fun-Doh" making it read "Doh" this may be a reference to Homer Simpson's catch phrase "Doh!" Fry makes a Homer Simpson head out of "Fun-Doh" a duplicate of "Play-Doh", however in "The Luck of the Fryrish" it is called "Doh-Doh". Advertisement for the Slug-o-vac, device created by the Professor to remove Brain Slugs, distributed by Good News Innovations. Deliveries are not available for the Island of Canada or Omicron Persei 9. This page was last edited on 25 May 2018, at 22:55.